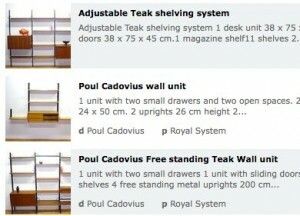 Fans of the CADO and Royal System modular shelving systems know that complete sets and spare parts can be hard to come by. Design Addict’s marketplace a good place to keep track of what’s available in the market, and Netherlands-based Aardewek en Zo is one reliable source for these units. Sadly, it’s already been sold, but Belgian online retailer City-furniture.be has great photos of a 60s Poul Cadovius Royal System floating wall unit with writing desk. Still available for about $2600 USD is a 1960s FM Teak Hanging Book Rack Unit designed by Kai Kristiansen for Feldballes moebelfabrik. That’s Robelan‘s motto, and though the New York-based firm caters to designers of retail spaces rather than direct to consumers, it’s easy to imagine the possibilities of the Robelan Polarity® System and its mobile counterpart, the gondola, for home use. Their catalog is full of parts and accesories for what looks to be a high-quality line.